Roofing is our passion—and that passion overflows when we’re offering advice to homeowners roof repair tips on how to keep the beautiful roof we just installed in tip-top shape, over the long-term. If your only ‘inspection’ is noticing shingles once they’ve fallen off—then you’re waiting too long to inspect and repair your roof. Instead, put a notice in your smartphone twice a year to climb up on the roof to look for roofing elements that need repair. While inspecting your roof, specifically look for balding or bald roof tiles, missing tiles, raised and/or curled tiles and flashings that aren’t laying entirely flat. Replace any missing tiles and any tiles that look like they’re in rough shape. Ensure that your tiles are laying flat, because if not moisture can leak in and cause damage to your roof and attic. We can’t stress enough how important it is to clean out your gutters. Dirty, clogged and over-flowing gutters will not only cause damage to the edges of your roof, but that moisture can seep into your attic and drip down the walls of your home. Your roof can’t do its job of protecting your home if your gutters aren’t able to do theirs. So, pull out the ladder and clean out your gutters in the spring and fall—and then again after every major storm. Fungus is the secret killer of roofs. 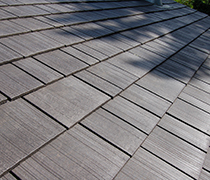 While it more adversely affects wood roofing, asphalt tiles are susceptible too, so while you are inspecting your roofing tiles check for signs of fungus, algae and mould. If you find any, you’ll want to install zinc strips to kill the mould, and keep it from ruining your roof and seeping into your home. Your roof is only as strong as its sealant, so check all the sealed areas around the edge of your roof, flashings and chimney (if there is one). If you notice any area that isn’t sealed properly or looks like it is about ready to call it quits then reseal the area by removing all old caulking, cleaning the area and then resealing it with mortar or caulking. All your roofing needs to protect your home over the long-term is a little TLC and regular care—and that’s the best of our roof repair tips, to simply schedule time to pay attention. If you can do that regularly your roof will protect your home for years to come—and maintain its value. This entry was posted in Roofing Advice, Roofing Tips and tagged Roof, Roofing, Roofing Advice, Roofing Repair, Roofing Tips, Roofs. Bookmark the permalink.